On January 9, 2010, my husband and I had our first son. Now, my husband and I had had a girls’ name picked out since before we were married. And we had spent months discussing boys’ names, but we had been unable to decide on our favorite. We had a list of about ten that were tolerable, but the ones I loved my husband only liked and the ones he loved I only liked. In an effort to delay the decision-making, I suggested to my husband that perhaps we should wait to see what the baby looked like. I hoped that once we met him, he would make known to us what his name should be. I’d heard lots of parents who said this was the case, so it seemed to me like a reasonable way to go about things. My husband agreed, but he insisted that we narrow our list to just three favorites before heading to the hospital. The three we decided we liked best were Julius, Elliot, and Wesley. I went into labor on the morning January 7, three days after my due date. I was expecting a somewhat long labor, as I knew the baby was face up, and I was also expecting I would probably have painful back labor. We were hoping to be able to have the baby naturally, without any kind of medication, as we thought that would be safest for the baby and for me. However, after 48 hours of unmedicated back labor followed by nine hours of Pitocin-augmented labor had failed to produce anything close to the desired result, we decided that a Cesarean section would probably be the safest course of action for the baby. Fortunately, this was not considered an emergency C-section since the baby’s life was not in immediate danger, so the anesthesiologist had plenty of time to prep me and my husband was able to be in the operating room with me. The C-section went smoothly, and I heard the baby cry as soon as he was taken out. But (and some doctors theorize this happens when an infant’s first cry is too strong) unfortunately he developed a collapsed lung immediately after birth and had to be taken to the NICU before I’d had a chance to hold him. The nurses briefly held the baby up from across the room for me to see (I remember thinking that he was big and kind of greyish but otherwise healthy looking), and then he and my husband were rushed off to the NICU. My husband came back a little while later while I was in recovery. I remember one of the first things he said to me was, “So what do you think he looks like? I think he’s an Elliot.” Now I had imagined that after our baby was born, we would both have a chance to hold him. And after a few hours of bonding with him, we’d look at each other and say simultaneously, “I think he’s a ____________ .” This seemed patently unfair to me that before I’d had a chance to really even see the baby, my husband was already telling me what name he thought fit best. We tried it out for a full day, but it just wasn’t working for me. The “t” at the end was too hard to say — it didn’t really flow out of my mouth the way I wanted his name to. And I wasn’t happy with any of the nickname options. We had discussed calling him Lio, but it seemed just a little too grown up for our tiny little guy. I eventually resorted to calling him Baby Ellie, which I knew was a very bad idea. The baby had been born by Cesarean section, so perhaps it was fitting (cheesy? fitting? cheesy?) 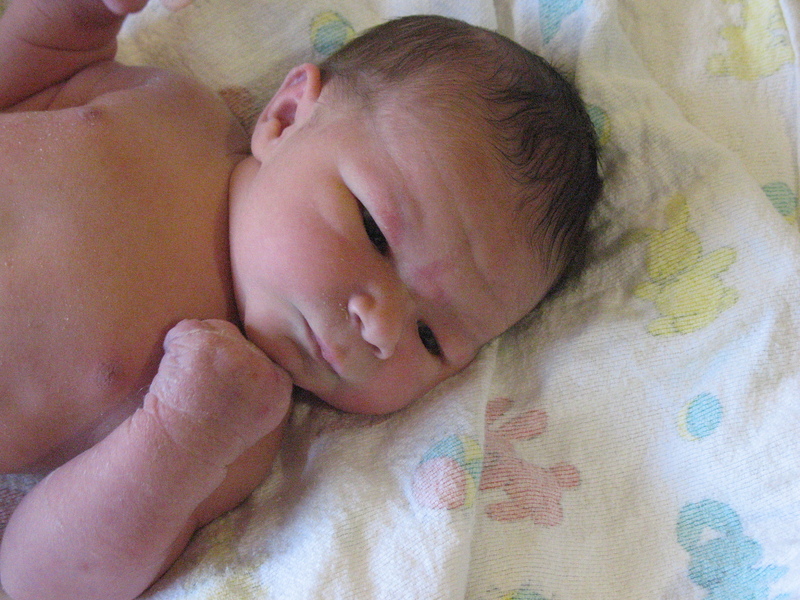 to name him after the one legend designates as the original Cesarean birth. We would not have considered this reason if we weren’t already in love with the name Julius, but maybe we could take that as a sign. Hanging on a closet door in the hospital room was a sleeper with Paul Frank’s Julius monkey on it. Some friends had brought it by the hospital as a baby gift. They did not know what names we were considering; they had simply seen the sleeper on sale at TJ Maxx and thought it was cute. And this last one I probably shouldn’t be sharing, but I’ll just say that one of the nicknames for the name Julius means something in another language that has something to do with his conception. We figured if we were going to use the name Julius for any of our kids, maybe that was a sign that it should be for this one. And, no, we don’t plan on telling him this — ever. And that’s how our son became Julius Arthur. It still took about three months before I was convinced we had picked the right name. I’ve learned from this experience that, while the idea of naming a baby at the hospital may work for some people, it does not work for me. When the time comes for baby #2, we plan to have the name chosen well before the baby is due. He does look quite serious and wise, just like I’d imagine a Julius! Thank you for sharing, Emily! What an intriguing story. :] I think Julius Arthur is incredibly handsome. Yay an update! I hope there’s more to come. I love the name, I think Julius Arthur is sophisticated and fun. Good luck! I’m so glad you updated your blog. It’s great to see little Julius’ pictures. Although I knew his name already it’s great to read the whole story behind it. Wow! I had Sam and Ethan’s names picked out months in advance. I know Ethan is an Ethan, but sometimes I look at Sam and think, maybe he should’ve been Sebastian Samuel instead… 8 months down the line, I’m not inclined to change it. I’m a big fan of Julius Arthur – and love that his initials spell JAG. This is a fantastic naming story — thanks so much for sharing it! I went to the hospital fully intending to name child #3 Zoe Alexandra, but she came out of the hospital named Calypso Persephone. Sometimes even having a name picked out doesn’t pan out.